It’s been quite awhile since I spent any time in the garden that I call Elaine’s View. Elaine lives in the house next door. A few years back, I gave her a hard time (in a teasing way) for letting the garden on her side of the driveway pretty much go to pot. I reminded her that I stand in the kitchen looking out at her driveway while I do the dishes. It would be nice if I had something colorful to look at! She obliged, and really got that plot in order. I haven’t really returned the favor lately. Our houses are side by side, facing west. So the way the shadows fall, my side of the driveway is north-facing, and extremely shady. Her side of the driveway is south-facing, and very conducive to lovely flowers. I finally decided to investigate some shade loving plants, and I put some effort into creating what turned out to be a very nice shade garden. I found some Jacob’s ladder, some Solomon’s Seal, a few hostas, a few ferns. And just when I thought the border looked pretty darn good, the new A/C unit was moved and now sits right smack in the middle of the plot, and I have to start all over again. Any suggestions on how to mask that beast? It looks like a focal point of Elaine’s View. I don’t want to impede the work it does to cool our house, but if it this unit can be fenced in or blocked somehow, I’d be a very happy camper . . . er, gardener! Out in the yard last evening, finishing up some mulching, when I took a look at the gerber daisy that Brittany had planted. The leaves were looking suspiciously lacy, and I spotted 3 large slugs enjoying the lovely plant. Smaller slugs were attached to the centers of the flowers. I quickly plucked them from their dinner and threw them on the street. We have had a lot of rain lately, and the ground is pretty wet. Perfect conditions for my least favorite garden creature. How do you control slugs? I have heard of a few remedies, but the first one that came to mind last night was beer. My dad used to set out small butter dishes of beer to trap slugs. So I found a small shallow dish, dug a small hole next to the gerber, and filled it half way up with beer. Heading to the watering hole . . . This morning, I discovered six large slugs had drowned themselves in yellow gold! Keep a dryer garden. Well, no kidding. Let me just confer with Mother Nature on this one. However, in dryer times, limit the watering to early morning. That will give the ground and plants all day to dry. Those slugs come out at dusk and dine through the night. Spread mulch from certain plants that deter. Oak leaves can be shredded with a lawn mower and used as mulch. Something called wormwood tea is also a good deterrent. From what I gather, you can brew dried leaves and flowers from the wormwood plant and spray the ground and foliage of slug-favored plants. Wormwood is used as a remedy for parasite worms, so I guess this makes sense. Copper strip barrier – form a ring out of a thin copper strip and place it on the soil around plants that are susceptible. Sprinkle salt directly on any predators you see. Coffee grounds, coarse sand, seaweed meal all have properties that repel these slimy pests. These items create an uncomfortable path which makes slithering impossible. Every year I vow to control slugs before they ruin my hostas. And every year, I’m reminded that I waited just a bit too long. I really haven’t thought much about the shade garden for the past few years. It was my ‘original’ original, the first garden I planted from scratch, so to speak. So much work to prepare the ground and find the right plants to survive in the shade of my beloved crabapple tree. As in most gardens in areas that freeze, some of the perennials make it through the winter, some do not. That’s the main reason I have tried to map out my gardens, so that from year to year, I will recognize what pops its head out in the spring. Most of what has survived from year to year in my shade garden, without much attention from me, are the numerous hostas. Once I realized how unbelievably easy they are to start, I gathered many varieties. My favorite is a blue leaved giant variety I found at Spring Hill Nurseries. I’m not a fan of the flowers that this specimen produces, as they are a bit obscene. I snip them before they even bloom. I have a few astilbes that I love, a deep red one and a beautiful white one. The color fades on these, but even the dead stems add texture and variety to the garden. Most of the color of this garden, however, comes from the impatiens that I plant regularly. 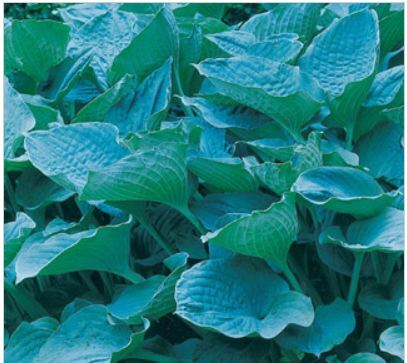 The search is on for some colorful items that recover as nicely as all the hostas. 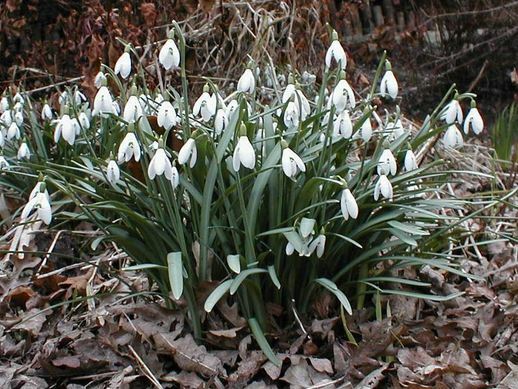 I found a lovely blog this morning called Carolyn’s Shade Garden that introduced me to an interesting shade flower called Snowdrops. Turns out its a winter flower, and I was so excited to realize that Carolyn gardens in Bryn Mawr, PA which happens to be a zone 7a area. Not much different that my zone 5b. I cannot wait to enhance my Shade Garden with some of the flowers I plan to purchase from Carolyn. She offers Snowdrops and hostas on her website. She speaks on cyclamen, and I’d love to obtain the secret of a successful cyclamen. Mine have a very interesting leaf, but lately all that I see from my crop are single pink flowers, no leaves. Also plentiful on Carolyn’s site were Hellebores. I was first introduced to Hellebores at the Philadelphia Flower show. Last year, the theme was a British theme. With England being the home of native Hellebores, most of the displays featured Hellebores of the soft green and white variety. Subtle yet impressive; but if there are colorful Hellebores to be had, I’m gonna find them also! Another website that I visited, A Way to Garden offers some good information on caring for Hellebores, in addition to information on adding a water feature to the garden. 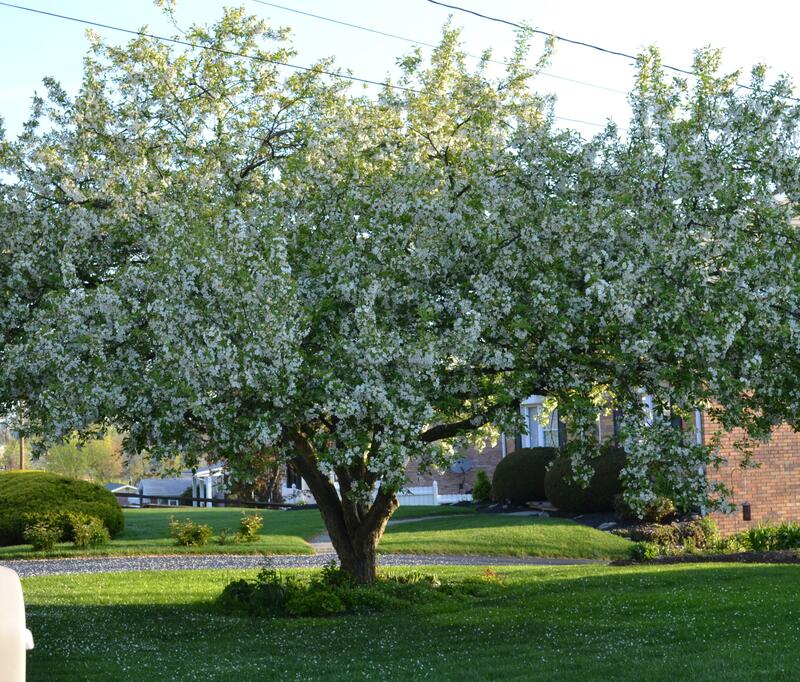 Great plans are in the making for The Crabapple Shade Garden this year!